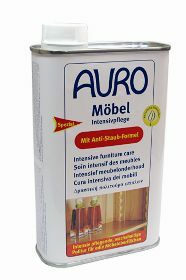 This wax-containing polish gives your precious furniture an antistatic surface and intensive care. Thus it contributes to the long-term maintenance of your furniture's value. water; linseed oil; as ammonium soaps: shellac, stearic acid, carnauba wax, beeswax; rosemary oil; cembra oil; phenoxyethanol; xanthane; potash; benzoic acid.